How would you design an algorithm to process 40Mpx image? 100Mpx? What about gigapixel-sized panorams? Obviously, it should differs from those that are intended for 640x480 images. 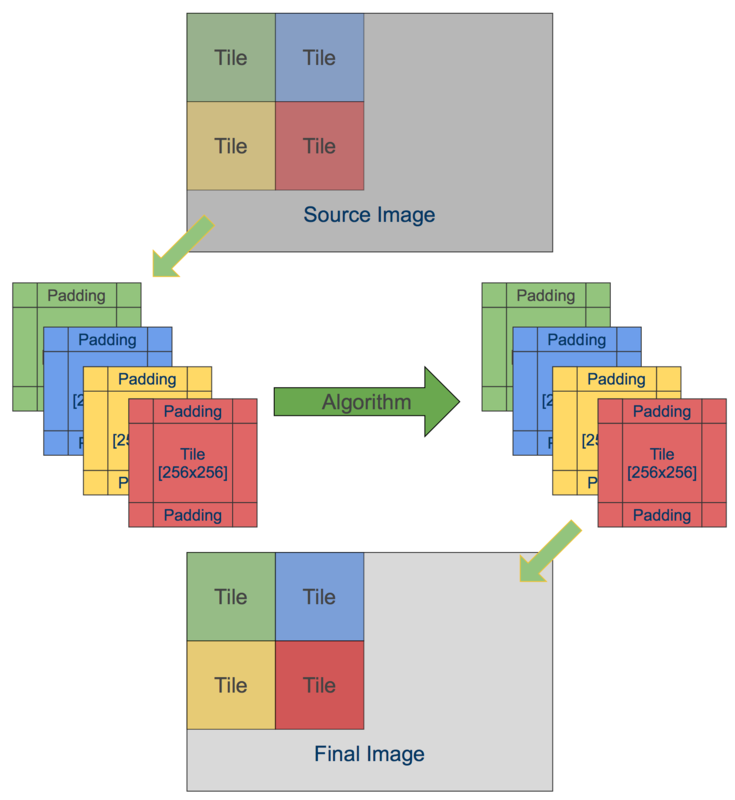 Here I want to present you implementation of the very simple but powerful approach called “Tile-based image processing”. I will show you how to make this using OpenCV. First, let’s define a few restrictions in order to simplify our implementation. In this tutorial I will consider a ‘pass-through’ pipeline - when we apply some function to input image and give an output image of the same size as an output. It is possible to extend this approach to work with many input images, but for the sake of simplicity I’ll omit this for now. Take a source image for RGB color space. Convert in to grayscale color space (unsigned byte). Compute Sobel derivatives (signed short). Take a Dx, Dy for each pixel and compute it’s magnitude and orientation. Leave only those, which magnitude is larger than threshold. This routine require N + 2 * N * sizeof(signed short) bytes of additional memory for straightforward implementation, where N is number of pixels in source image. Large number of intermediate buffers can cause memory issues for memory restricted devices (mobile phones, embedded systems). On iOS, in particular, your app might get terminated by iOS watchdog for high peak RAM usage, despite the fact you use this memory only for a temp buffers. Second issue with large amount of buffers is cache-misses. Large buffers are likely to sit near each other, therefore cache performance will be low and algorithm performance will suffer. To adress those two issues, I suggest to divide input image into “Tiles” - regions of the original image of equal size, let’s say 64x64. The processing function remains the same, but we reuse all temporary buffers and process only 64x64 pixels at one time. Let’s say we’re processing 1280x720 frame, using regular approach, the total amount of additional memory is 4.6 megabytes (4608000 bytes). With tile-based approach, we need only 20 kilobytes (20480 bytes). 20K are likely to fit entirely in L2 cache and therefore give a significant performance boost. To implement tile-based implementation, we iterate over the image, copy tiles from source image to our local source tile, process it and write to corresponding area in the destination image. I hope it’s clear to understand what is happening in code above. The Algorithm here represents some algorithm that we want to run on our tiles. There are two functions copyTileFromSource and copyTileToResultImage that will be covered a bit later. You may ask yourself - what should we do with border pixels? Sobel operator use neighbor pixels around each pixel. When we construct a tile shouldn’t we take this into account? Sure we are. So that’s why there is a padding parameter that controls amount of additional pixels that are added to top, left, bottom and right of the tile in order to make functions that require additional pixels work correct. 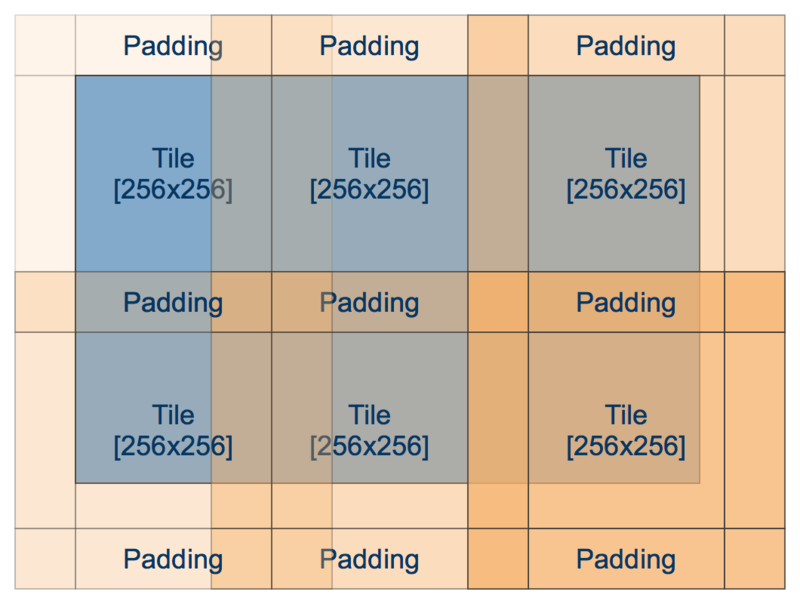 Padding makes tile overlap each other, but we pay this price for good cache locality. 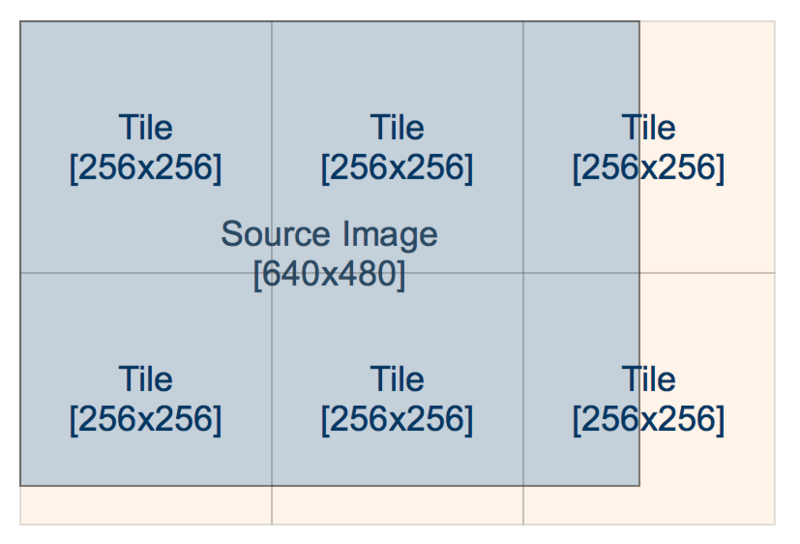 For non-zero padding case we add additional pixels to source tile, therefore it has effective width and height of TileSize + Padding + Padding, but after processing we write only central segment of the tile of size TileSize x TileSize to destination image. 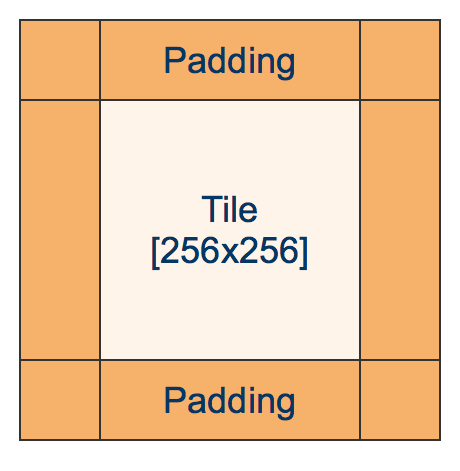 In case of Sobel, we need a padding of 1, because Sobel uses 3x3 kernel by default. Did you know, that JPEG-2000 coded use tile-based encoding and it allows this codec to retrieve (decode) an arbitrary region of the image? Also, tiles are widely used in aerial photography to stich images. I hope you find this post interesting. Pleas let me know on which topics you would like to see in my blog. Feel free to drop a ping on @cvtalks or leave a comment. Thanks!